Earlier this year, when I was the queen of the Stitch Tease Bee, I asked my bee mates to make Intersection blocks using Film In The Fridge's fun tutorial. 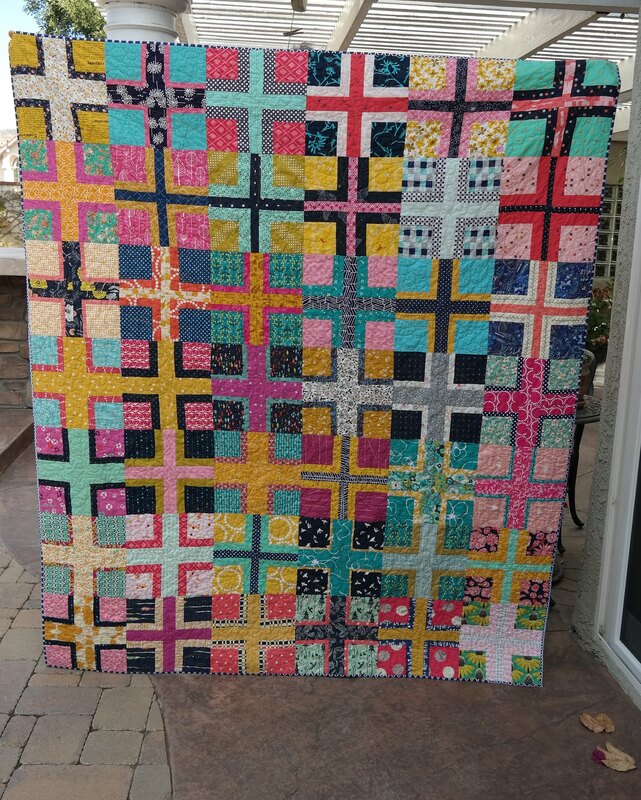 I asked for blocks using mustard, navy, teal, and fuschia fabrics. Twenty-three blocks arrived from my sweet friends. I made nineteen more so I could have a 6x7 block layout, resulting in a good sized lap quilt. 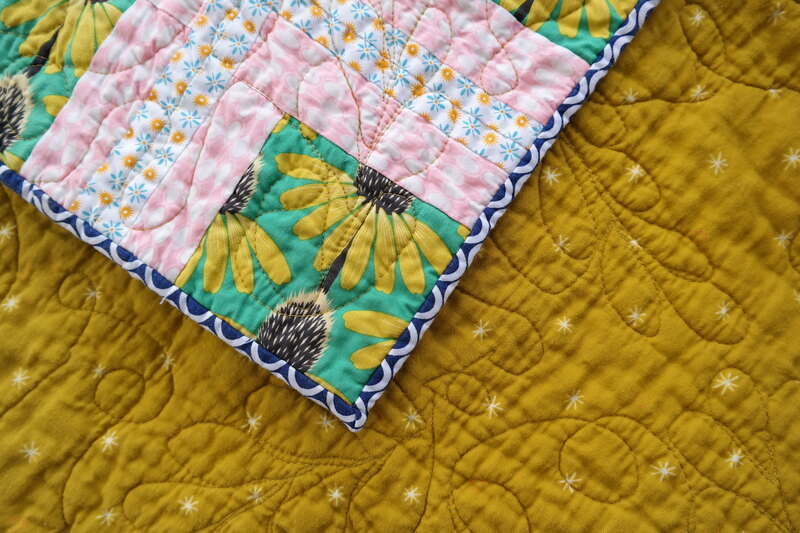 I pieced all the blocks together and then set it aside until a few weeks ago when I decided that Cotton & Steel's Bespoke Spark double gauze in Mustard would make the perfect background. 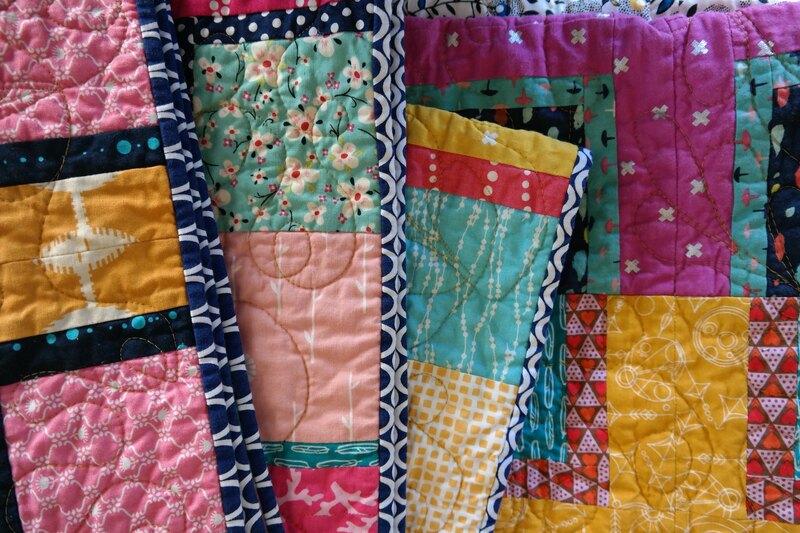 It is so soft and was a dream to free motion quilt. I am getting a little more brave when it comes to free motion quilting and for this project I used a swirl and stem pattern with leaves on it. It's just random and was fairly easy to do. I got a good rhythm going and was able to get it finished in two afternoons. Aurifil's thread color #5022 was a perfect choice. I am really on a mustard kick lately. I just love this color so much that I chose it as part of our wardrobe color choices for our family Christmas card photo. My kids had a ball with that one, wondering if mom wanted them to wear Gulden's or French's...or maybe Grey Poupon! I wanted the quilt to be finished with a navy binding, but didn't have many choices in my stash. I ended up using Navy Ovals Remix by Robert Kaufman. 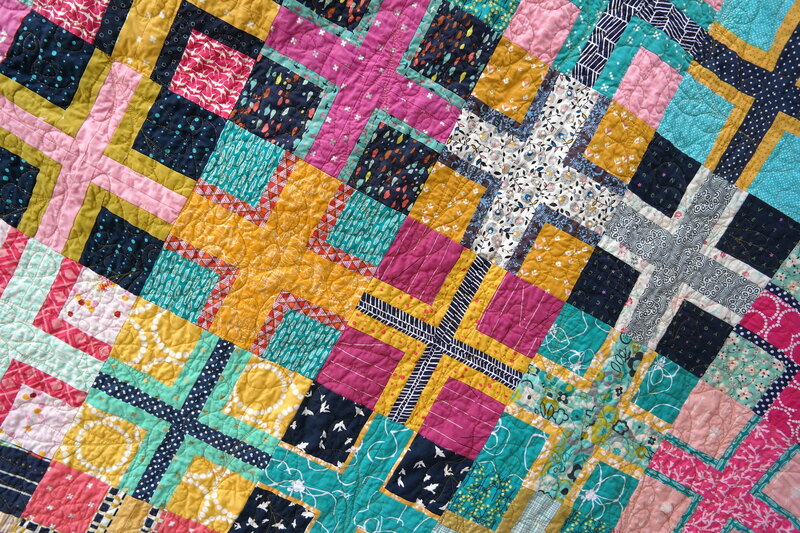 I am calling this quilt "Crossing Paths" because it is for my very special friend, Pam, who also happens to be my son's mother-in-law. She is such a fun, kind and encouraging friend. I don't get to see her much but I know if she lived closer we would hang out all the time. She's one of the funniest people I know and also one of the most honest. I am so happy to be able to gift her this quilt and I sure am glad that our paths have been crossing for the last 16 years. Size after Laudering: 60" x 72"
This pattern always turns out nice, and your especially so. What a great gift for your special friend! Your quilt turned out beautiful! I hope your friend loves it! Fantastic colors I might not have joined in one project. Beautifully executed, too.